Monica Furmanski, photographer and installation artist, directs the viewer’s experience, blurring the lines between image and reality. 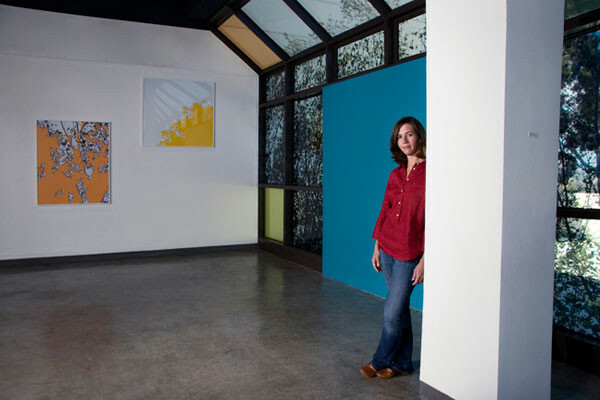 In 2002 Monica placed window-sized, slightly out-of-focus transparencies of tropical vistas in the existing windows of a gallery in Pasadena. In 2003 another installation created wall-sized images of landscapes where none existed. These and subsequent installations present a space for the viewer to explore the ambiguities created between the images and the viewers expectations. Cryptofloriography, a series of images created in 2007 in which selected elements of rain forest photos are removed digitally, continue this exploration of visual expectation, forcing the viewer’s engagement. If in her earlier work she was “pushing the image into the viewer’s space,” these more recent works make a space for the viewer to enter into the image. Monica and her husband, FOTM Master Artist Matt Furmanski, operate a gallery in Ventura that highlights the work of emerging, cutting-edge artists. Monica Furmanski’s documentation took place in 2009 and was Sponsored by Dr. Norma Beck. The FOTM Archive contains extensive information about this artist.